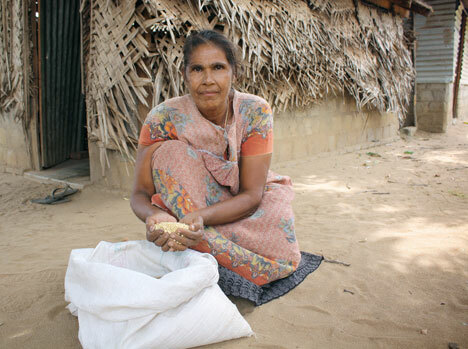 Sujithar displays a harvest of soybeans outside her home in Muthur, Sri Lanka. UMNS photos by Michelle Scott. Bombed out homes stand empty next to verdant rice paddies throughout the eastern Sri Lankan countryside. New life is springing up in the midst of places that once saw death and destruction. As Sri Lanka enters an era of peace after more than 20 years of internal conflict, the United Methodist Committee on Relief is providing a helping hand to those whose lives have been the most devastated. The relief agency’s four field offices in Sri Lanka provide a hand up to people who were trapped in a cycle of displacement by the conflict and the tsunami that struck in December 2004. Sujithar is a widow who lives in the town of Muthur—a place that saw heavy fighting in 2006 and was deeply affected by Sri Lanka’s long-running war. She lives alone in a ramshackle house that is part thatch and part corrugated aluminum. From the back, one can see the foundations of the home she lost in the war, her current shelter, and a concrete and brick house that is under construction. Sujithar lives alone and scrapes by on subsistence farming. She has a small plot behind her home where she grows a variety of vegetables. She talks about another acre she has elsewhere that she is unable to cultivate because there is no well nearby. In this growing season, Sujithar tried something new. As part of UMCOR’s soybean project, implemented in partnership with a local organization, she grew what added up to 500 kilos of soybeans on her small plot of land. While few people eat or grow soybeans in this region, they are a popular commodity for feed. She was able to sell the soybeans and improve her living environment. The soybean plants also injected her heavily cultivated land with a dose of soil-boosting nitrogen—enriching her soil for other crops. When asked what she did with her extra income, a wide smile spreads across Sujithar’s face. She takes her visitors to her back room and turns on a small television set. She is very proud of her new link to the outside world, thanks to a booming soybean crop. It’s a small luxury, but an important step for someone who has struggled for many years just to survive. As she continues to build her new home brick by brick, Sujithar’s new soy crop gives her greater stability. Young people also suffered greatly during the war. The relief agency is helping a group of young women who were not able to go to school because they were forced to be soldiers. A sewing machine, some training in clothes making and business skills have set these young women into motion. Sitting behind the treadle sewing machine she received from the agency, one young woman, who did not want her name to be used, explains that she has been hired to sew school uniforms for a local school. This and other sewing projects allow her to help support her two sisters and pay for household expenses. She shares a modest home with her sisters and mother. The house is spare, but clean, with a concrete foundation and a thatch roof. Tarps from the United Nations are draped over a clothesline to create walls. Her sewing machine sits prominently in the front room. The young woman’s father died in 1990 and her mother’s income from cleaning houses barely provided for the family’s needs. The increased income from Syahana’s sewing is helping this family find their way out of poverty. Soybeans and sewing machines are stepping stones to a better life for people who lost all their resources during the long war in Sri Lanka. The United Methodist relief agency established its office in Sri Lanka following the 2004 Indian Ocean tsunami. Country operations are based in Colombo with program offices in Batticaloa, Trincomalee and Vavuniya. All of the agency’s programs in Sri Lanka are carried out in close cooperation with the Methodist Church of Sri Lanka. In 2006, when fighting broke out in one of UMCOR’s project areas in Sri Lanka, the agency began helping people displaced by conflict. The agency and its partner, Muslim Aid, were among the first to respond to the new crisis and were able to coordinate assistance to some 57,000 displaced families. To support United Methodist work in Sri Lanka and provide refuge to those whose lives have been uprooted, gifts may be made to Sri Lanka Relief and Development, UMCOR Advance No. 3020630. *Scott is the executive secretary for UMCOR communications.